World in View: For a Free Syria! 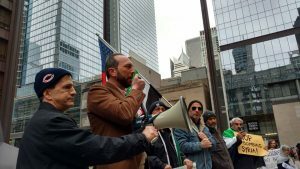 Chicago—On Feb. 21, members of the Syrian community and activists demonstrated in opposition to Russian and Syrian regime bombing, and echoed the call of Syrian civil society organizations for a no-fly zone. The rally was organized by the Antiwar Committee in Solidarity with the Struggle for Self-determination. More rallies are planned here in support of the Syrian revolution. This entry was posted in Articles and tagged Antiwar Committee in Solidarity with the Struggle for Selfdetermination, Chicago, Free Syria, Gerry Emmett, no-fly zone, Russia. Bookmark the permalink.